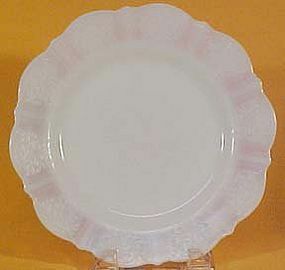 MacBeth-Evans American Sweetheart monax 9" Luncheon plate is in excellent/mint condition. This pattern was made from 1930-36. Fourteen plates are available. 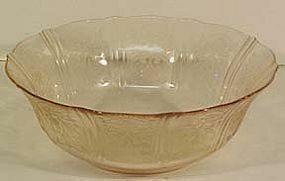 MacBeth-Evans American Sweetheart monax 6" Cereal Bowl is in excellent/mint condition. This pattern was made from 1930-36. There are 2 bowls available. MacBeth-Evans American Sweetheart monax Creamer & Sugar are in excellent/mint condition. This pattern was made from 1930-36. We have two sets available. MacBeth-Evans American Sweetheart Cup and Saucer, pink, is in excellent condition. This pattern was made from 1930-36. Two are available. 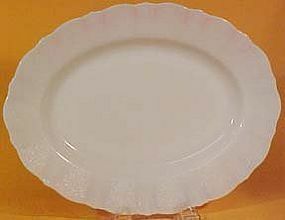 MacBeth-Evans American Pink Sweetheart 12" Salver Plate is in excellent condition. This pattern was made from 1930-36. MacBeth-Evans American Sweetheart monax 13"x10" Platter is in excellent condition. This pattern was made from 1930-36. 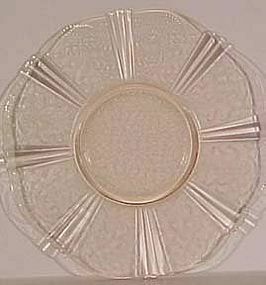 MacBeth-Evans American Sweetheart Vegetable Bowl, 11"
This hard to find Monax American Sweetheart 11" vegetable bowl is in mint condition. Made by MacBeth-Evans from 1939-36. 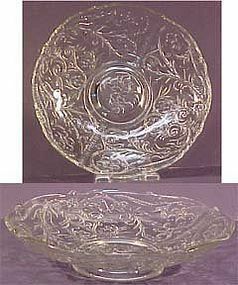 Dogwood by Macbeth-Evans Glass Company was made from 1930-34. These pink cup and saucer are in mint condition. Three sets are available. 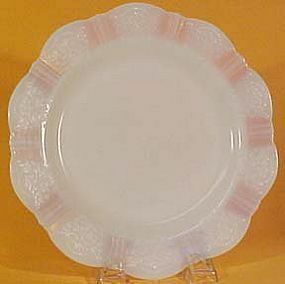 Macbeth-Evans Petalware 9" Dinner Plate (milkglass). Produced from 1930-1942. Six are available, all in excellent condition. 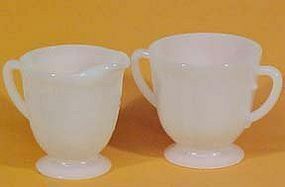 Macbeth-Evans made petalware from 1930-42. 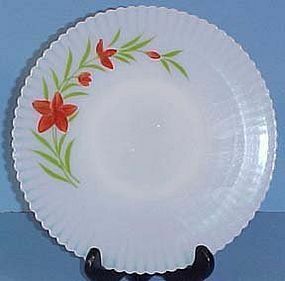 This Florette 11" salver is in mint condition. 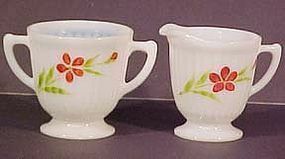 MacBeth-Evans Petalware with the Florette decoration creamer and sugar were made from 1930-50. Both in excellent condition. 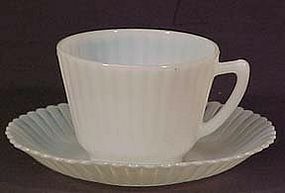 Macbeth-Evans Petalware, Monax cup and saucer. Three sets are available, all in excellent condition. Produced from 1930-1942. 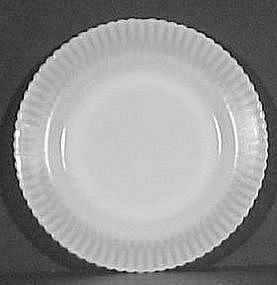 Macbeth-Evans Petalware (milkglass) 10.5" Dinner Plate/Salver. Both in excellent condition. Produced from 1930-1942. 2 are available. 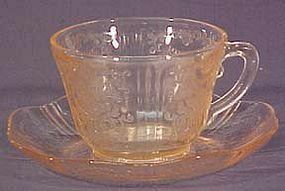 MacBeth-Evans Glass Co. made American Sweetheart from 1930-36. 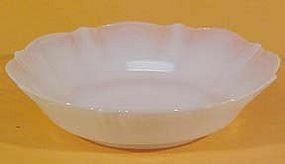 This 9" bowl is in excellent condition. 3 are available. 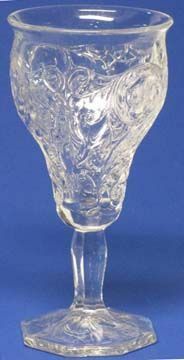 McKee Rock Crystal 5.75" Stem, crystal, was produced from 1922-31. Six (6) are available, all in mint condition. 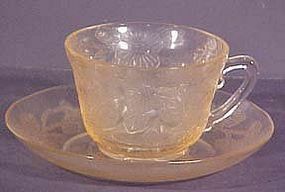 McKee Rock Crystal 6.75" Stem, crystal, was produced from 1922-31. Four (4) are available, all in mint condition.